It is disturbing when you find out your beliefs aren’t true. Our reality is often determined more from our beliefs than from objective truth, and surprisingly we don’t always know the difference. These beliefs are mostly developed during our youth when we are the most impressionable. For me, the hotbed development of my beliefs was high school basketball. I grew up in a small Midwest town that idolized basketball. We didn’t live too far from Indiana University where the legendary Bobby Knight was winning national championships. The game had a special hold on me. I was practically an only child who lived 10 miles from nowhere. Basketball was a team sport, but it was easy to practice if you had a ball and a hoop. At that time, sports were motivated with negativity. You were either lazy or stupid or maybe both. I remember hearing our coach tell one of my best friends that if he didn’t learn to work harder, he was going to be on welfare just like his daddy. My friend quit the team. If I’m honest, I secretly judged him. Instead of taking the coach’s advice to work hard, he took what seemed like the easy way. My belief was that quitters are losers. During my four years, more boys quit the program than finished. It was driven by negativity, and the hope was that through negative pressure, the boys would perform better. To reinforce the belief, the program experienced some success. The varsity team my freshmen year went undefeated until it crashed into a juggernaut of a team that went undefeated two years in a row winning back-to-back state championships. The next year the teams got steadily worse. With the decline, the negativity was increased. There was still a lot of talent, though honestly not to the same degree, but the boys did not respond well the constant negativity. I found myself being as loyal as I could but declining in favor with the coach. The message was coming in loud and clear that I wasn’t measuring up to expectations. People talk a lot about how sports build character, but out of the starting five of that undefeated basketball team: I don’t want to get personal, but life has not been so kind to the ones I still know. As for my friend who quit, he gained an almost miraculous confidence and went hard after an education, a job, and a wife. To this day, he is by all standards successful. And then I started thinking about all the other quitters. There were a lot of them. Almost every one of them has a strong faith in God, a healthy marriage, and a steady job. I’m sure I silently judged them all these years, even though I noticed they became stronger people after they quit. My aha was that I did not become stronger by staying. It took more strength to quit than to stay. I’m sure this isn’t always the case and that quite often character is built from sports. I did gain a strong work ethic and discipline from my time playing ball. But this belief that quitters are losers is totally wrong. Sometimes the very best thing you can do is quit. It can reassure you of your own value. It can build confidence as you say no to power. It can create freedom as you refuse to be objectified. What have you realized isn’t true? Let me know. I’m curious. As coaches, we have the ability to help our clients challenge their beliefs. We don’t get to judge what is true or what isn’t, but we can certainly ask, “How true is that?” Most obstacles are internal. We can provide a safe place for our clients to consider what is true and what is not. Beliefs are at the very core of who we think we are and how we see the world. The most powerful changes can come at this level when our client comes to a clearer understanding of reality. 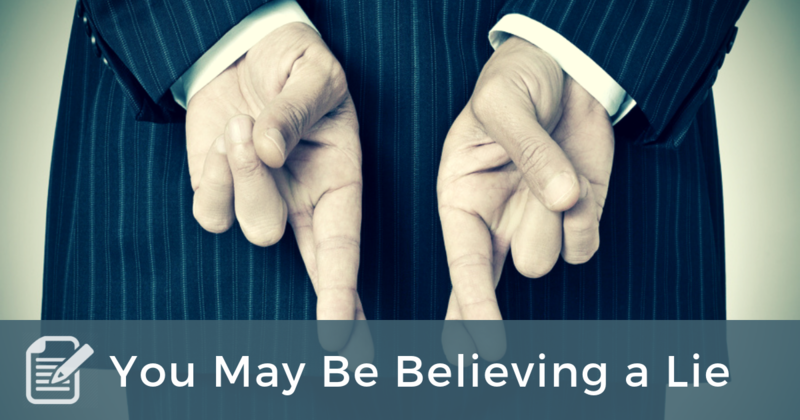 Do your client a favor and challenge her belief. It might change the course of her future. Good insight, Brian. I was relieved of the belief that quitters were losers when after 8 years in a church and little progress to show for my efforts, a Godly deacon counseled me that quitting and moving on could be a sign of strength, not weakness. A few months later I accepted a call to another church and was able to start afresh.